On February 5, 1997, Uyghur demonstrators in Ghulja took part in a non-violent protest calling for an end to religious repression and ethnic discrimination in the city. After violently suppressing the demonstration, the Chinese authorities subsequently rounded up large numbers of Uyghurs suspected for their involvement. On the twentieth anniversary of the Ghulja Massacre, the Uyghur Human Rights Project (UHRP) highlights the continuation of repressive and discriminatory Chinese government policies targeted at Uyghurs despite the state initiated violence in Ghulja. "It has been twenty years since peaceful Uyghur protestors took to the streets of Ghulja to protest harsh curbs placed on their religious beliefs and the Chinese authorities' open discrimination. However, in those intervening twenty years, instead of seeking ways in which to address Uyghur grievances, Chinese officials have taken steps to increase the repression facing ordinary Uyghurs," said UHRP Acting Director Omer Kanat in a statement. Mr. Kanat added: "The documentation recording severe restrictions on religious freedom and high levels of extreme poverty among Uyghurs is overwhelming. 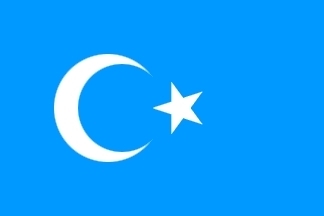 The United Nations, the EU, the United States, academics, overseas media and human rights organizations have all noted the inequities in East Turkestan resulting from Chinese government policies. Until the Chinese state accepts its role in gross human rights violations, the dead of Ghulja will remain a stain on its history." UHRP has recorded in reports abuses of Uyghurs' rights to religious freedom and development. Furthermore, documentation on the violation of linguistic rights and the right to free speech demonstrate the retrograde progress toward the realization of these fundamental human rights since 1997. In addition, UHRP believes a vague definition of "terrorism" within China's Counter-Terrorism Law legitimizes the use of excessive force against Uyghur civilians expressing peaceful dissent over government policies. Meshrep -- Image by UNESCO. 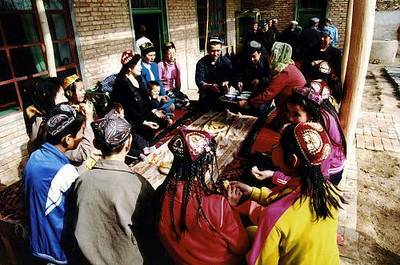 Among the policies that prompted the 1997 demonstration in Ghulja was the prohibition on traditional Uyghur gatherings known as meshrep. Chinese authorities banned meshrep just prior to the demonstration, despite the fact that Uyghur communities were using the meshrep to successfully fight alcohol and drug abuse among Uyghur young people. Human rights organizations documented a pattern of arbitrary imprisonment, torture in detention and unfair trials of those rounded up during the Ghulja protest. For their alleged role in the events, several Uyghur participants were executed. Despite credible evidence describing state violence used against Uyghur civilians, the extrajudicial killings have been recast as "the beginning of active terrorism in the country." Recent reports illustrate China's ongoing repressive policies that contribute to the decline in Uyghur human rights conditions. A December 1, 2016, New York Times article describes how the Chinese government has implemented a policy to confiscate passports in East Turkestan to limit the international movement of Uyghurs. Furthermore, thorough and frequent internal checkpoints curtail the ability of Uyghurs to travel freely within the region. China has also adopted a series of religious legislation curbing Uyghur rights to freedom of worship. Regulations control who can observe the Ramadan fast and visit the mosque. Private communal religious education has been targeted for a number of years; however, in 2016 Chinese authorities adopted rules to report parents who encourage their children to undertake religious activities.